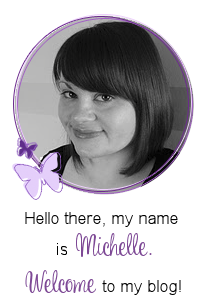 Hello there, today I have the pleasure of taking part in a blog hop to celebrate the release of new digi-stamps by Steph Made It For You. 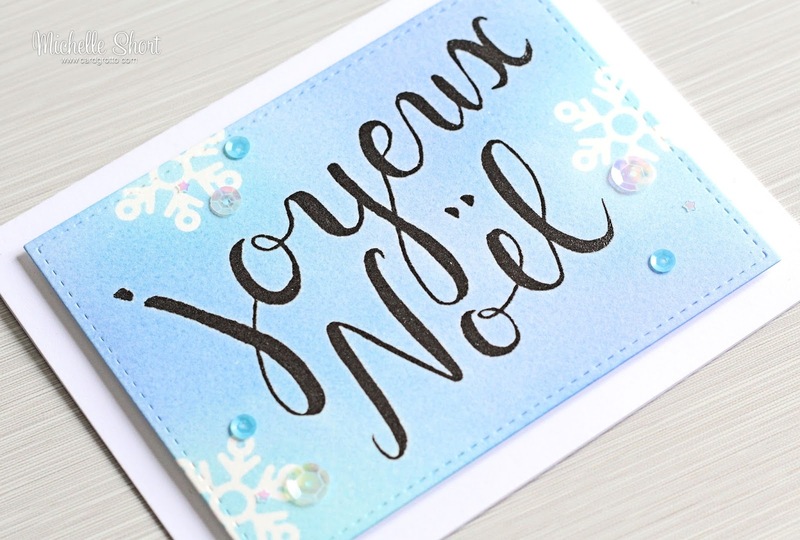 She is releasing some gorgeous French sentiments and I am using the beautiful Joyeux Noel one for my card today. I started off by printing the sentiment on to some Canson watercolour paper. As you can see, I kept the sentiment large to be the focal point on the card. Once the paper came out of my printer, I quickly applied clear embossing powder. Since my printer is an Inkjet, the ink stays wet for a little while and if you are quick, you can heat emboss. I then set the embossing powder with my heat gun. I ran the paper through my Cuttlebug using the Mama Elephant rectangle Femme Frames die. While I was die cutting, I also cut the SSS Ashlynn Snowflake die from mask paper. These were adhered to the panel and I took Distress Inks in Broken China and Shaded Lilac and blended these over. I then misted over a mixture of water and Perfect Pearls to give a subtle shimmer (sadly you cannot see it in the photo but it is there!). The panel was adhered to a white A2 card base with foam tape. I then added some Lucy's Little Things Lagoon sequins, along with a few Sparkling Stars to finish it off. Below are the links to the other people in the hop. 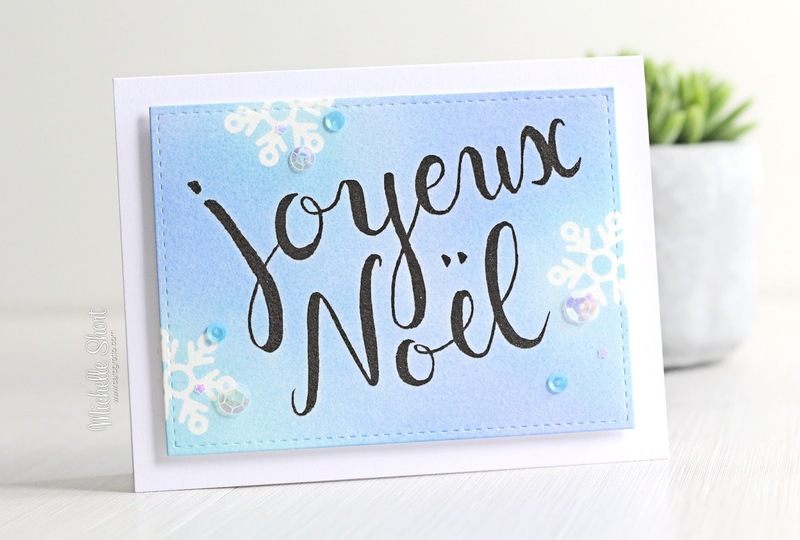 For a chance to win this Joyeux Noel digistamp, please leave a comment on the blog posts. The more you comment, the better the chance of winning! Comments close at 23.59 BST and Steph will announce the winner over on her blog shortly after. A really simple card but I think it would be a good one to mass produce for Christmas. Thanks so much for visiting me today. I hope you have fun in the hop and have a great week! 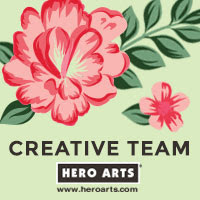 Thank you so much for taking part to my blog hop! Great design for massproduction indeed! I am so glad the impression on watercolour cardstock is good! I will definately try to embossed next time i print! I have done it on vellum and it works fine but didn't try on paper yet. I love the soft colours you picked and with Perfect Pearl mist as well, it is so great for a christmassy and shiny look! What a beautiful sentiment stamp. love it. I studied french at uni so would be good to use a stamp like this on some of my cards. Love the soft colours you've used. Will have to try that combo. Great sentiment and you made a nice card with it! Gorgeous card...love your beautiful sentiment!